For those suffering from the shopping bug, la Cremerie de la Vache is ideally situated. 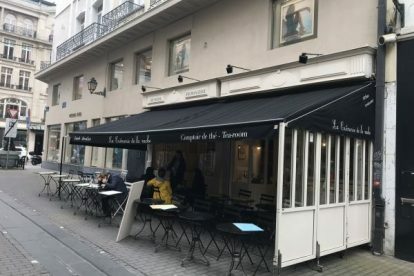 Located close to Place Stephanie, Toison d’Or and Avenue Louise, which amongst them host the crème de la crème of Brussels shopping, La Cremerie de La Vache is perfect for that well-deserved mid-shopping break, when your feet (and your wallet) are tired from boutiques. This patisserie, with its white tiles and wooden tables, is indeed reminiscent of an old milk-shop. The place doubles as a snack-eatery and a bakery/pâtisserie. If you are peckish you can opt for one of their tartines (sandwich), scrambled eggs or baguettes. For me, however, it mostly stands out for its fine selection of Marriage Frères teas and the accompanying assorted cakes and pastries. The fact that it is on a pedestrian street just off the busy thoroughfare is an added advantage, allowing you to sip your earl grey on the terrace.